Building a DIY desk can be a beginner to intermediate woodworking project depending on what plan you choose to tackle. Whichever one you choose, you'll find detailed building instructions, diagrams, and photos to help you along the way. This free DIY desk plan will help you build a beautiful and large desk that would look great in anywhere from an office to a guest room. The free plan includes a supply list, diagrams, photos, and instructions to help you build it. Here's another free desk plan from Ana White. This design will give a huge worktop and lots of space for storage. This free desk plan includes dimensions, a materials and tools list, a cut list, building directions, and photos of others who have used the plan to build their own desk. Home Depot has a DIY desk plan to build this modern desk that has a concrete top and wooden legs. It's a small size that will fit just about anywhere in your home. The free desk plan includes a materials list, step-by-step instructions and color photos for making the by top and building the legs. The design of this free desk plan by Ana White is inspired by Restoration Hardware's Sawhorse Trestle Desk. By building it yourself, you'll get the same look for a fraction of what you could buy it for. Plenty of color photos, a materials and tools list, a cut list, step-by-step directions, diagrams, and user photos are all included in this free desk plan. The Borrowed Adobe has created a free desk plan inspired by Pottery Barn's Printer's Writing Desk. 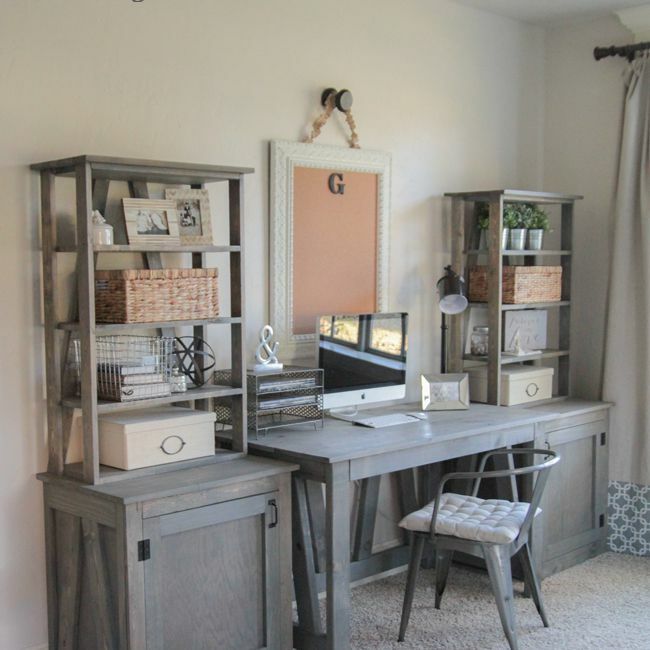 She was able to build this desk for a quarter of the cost the Pottery Barn desk. Download this free desk plans and you'll get a materials and cut list, written instructions, and color photos. House of Hoff has designed this beautiful DIY desk that uses a butcher block for the top and industrial piping for the legs. This can be used just about anywhere as a table also. There's a supply list, building instructions, color photos, and more to help you build this easy DIY desk in no time. If you're looking for a unique desk plan, this three compartment desk may be just what you're looking for. It will give you tons of storage and you can even use it as a vanity if you'd like. These DIY plans include a tool list, shopping list, cut list, step-by-step directions, diagrams, and color photos. Handmade Haven has a free DIY desk plan that builds this farmhouse desk with two shelves and a roomy area for a chair. It's a great size that would fit in just about any size of a room. The free plan includes a materials list, cut list, building directions, and detailed diagrams and photos. This small x-frame desk can be built for less than $50 and is perfect for a small space or a child's room. It has a 3 foot long top, a full-sized top drawer, a small bookshelf on the bottom. There's a materials and supplies list, cut list, building instructions, diagrams, and photos so even the beginning woodworker can tackle this project. Here's another free desk plan for a farmhouse style desk but this one if for a stand-up desk. It's a simple project that has a touch of industrial thanks to the pipe legs. There are directions, photos, and a materials list to help you build this unique desk for around $150. Here's a free desk plan that will build a simple desk using just 2x4s. It will cost you under $25 so there's no reason not to give it a go. Simple building instructions and diagrams will step you through using this free desk plan. We couldn't resist adding one more of Ana White's plans to the list, this one being a plan to build an office corner desk. Diagrams, step-by-step building instructions, color photos, and shopping lists are all part of this free desk plan. Download the free desk plan and you'll get color photos, a materials list, very detailed instructions, and tons of diagrams. Rona has a free DIY desk plan that builds this great looking desk that includes a cabinet and several drawers. You'll find the tools and materials list, diagrams, and building steps included in this free desk plan. Extreme How-To has a free desk plan that builds a desk perfect for the office that has room for a desktop or laptop computer. This is an intermediate woodworking project that will cost you around $150 to build. Included in the free desk plan are a tools and materials list, building instructions, color photos, and diagrams.